An active adventure in the Moroccan wilderness exploring North Africa's highest mountains and the world's largest desert. Ride mules in the High Atlas and cycle the southern mountain slopes. Explore the great Sahara desert by camel, sleeping in a traditional Berber tent among the dunes. Finally discover the ancient city of Marrakech and experience the evening street entertainment on the Djemma El Fna Square. Atlas Mountains villages - Head into the remote Atlas region of the fertile Tighza valley by mule and stay overnight in a traditional Berber gite, enjoying local hospitality. Sahara Desert - Travel to a desert camp by camel, spend a night camping under the stars. Marrakech - Explore the captivating medina and Djemma el Fna with its snake charmers and lively food stalls. Our tour starts today in Marrakech. Depending on the schedule of your flights, you may be able to explore the vibrant Red City independently before meeting your Tour Leader and group at the hotel. Located just outside the city walls, the hotel is only a 20 minute walk from the main Djemma El Fna Square. The new town is close by and it offers the options of small restaurants and fixed price souvenir shops. The hotel has a swimming pool and a restaurant and all of the rooms have air-conditioning. Departing Marrakech after breakfast head south, crossing over the Tizi 'n Tichka Pass (2260m) following a meandering course that takes us deep into the towering peaks of the Atlas Mountains. North Africa's greatest mountain range, the High Atlas presents us with some of the country's wildest landscapes, a region culturally removed from the rest of Morocco and one that has provided a barrier between the northern plains and the pre-Sahara for centuries. This is the land of the fiercely independent Berbers, the 'Lords of the Atlas', whose traditions and ways still hold sway up here in their mountain strongholds far away from the cities below. The Berbers present us with a unique view of a way of life lost to the rest of North Africa, where music and dance, even language and religion, are far removed from their Arab neighbours. Our morning's journey brings us passed the ruined Glaoui Kasbah of Telouet to the fortified village of Anmiter, lying at the end of the tarmac road. Here we join our mules and, at a more relaxed pace, follow a winding track with stunning views onto the small village of Tighza where we spend the night in a remote, local gite high above the valley. This family owned village house has many rooms with shared facilities as well as a lovely terrace providing great views of the valley. After breakfast we hike through the valley in this remote corner of the Atlas. Heading down the southern slopes of the High Atlas we reach the trailhead where we are reunited with our vehicle, the total hike duration is between two and three hours. After a couple of hours driving along the picturesque Ounila Valley with its barren slopes in sharp contrast to the rich green valley floor we reach our hotel located opposite the famous Kasbah of Ait Ben Hadou. After lunch (included on this day) we have a guided tour of the UNESCO Heritage Site. Ait Ben Haddou presents us with one of Morocco's most famous locations, a once important stop along the old trading routes between Marrakech and the Sahara during the 16th century and a superb example of a typical fortified ksar. The rest of the day is free to enjoy the hotel swimming pool. There is a restaurant, wi-fi and all the rooms are air conditioned. This morning we take to the saddle as we cycle from Ait Ben Haddou and down towards the fertile landscapes of the Draa Valley and the town of Ouarzazate - we may start earlier on the summer departures. Helmets are supplied in two sizes or you can bring your own for a better fit. The total duration is 23km, there is a support vehicle in attendance, so if anyone wants to opt out of the ride altogether or stop at any point during the ride, there is always the option of joining the support vehicle. Known as the 'Doorway to the Desert' this fascinating outpost, lying to the south of the High Atlas and sandwiched between the high mountains and the expansive sands of the Sahara is home to one of the largest movie studios in the world. The Atlas Film Studios boasts an impressive list of productions, including The Mummy, Gladiator, Babel, Kingdom of Heaven and Lawrence of Arabia. We'll pay a visit to the studios today, taking a tour of some of these famous film sets before we depart and continue through the beautiful Draa Valley. Driving by bus from Ouarzazate we cross a landscape lined with palm groves, Kasbahs and traditional ksours (villages), as we make our way to the village of Tamnougalt to explore what was once the capital of this remote desert region. The village's name translates as 'meeting point' and its history has been interwoven with the ruling qaids (masters) of the Mezguita region for centuries. Even today it hosts an annual festival in October when all the surrounding villages gather for a celebration of the religious and cultural traditions of these hardy people. Our kasbah style accommodation is located in the middle of the Draa Valley with its green palm groves. It has a swimming pool and easy access to the valley for nice walks in the fields. The rooms are air conditioned. Turning south today we follow the course of the Draa River, spending the morning driving through the ever-changing scenery as we make our way towards the vast oasis of Zagora, referred to by many as 'The Gate of the Desert'. Once a major outpost along the caravan routes, it takes 52 days by camel from here to Timbuktu, or so a nearby sign indicates! We continue on to Tagounite, which lies at the outer fringes of a line of undulating sand dunes that provide a taste of the immense grandeur of the Saharan Desert beyond. Amidst this seemingly inhospitable landscape the desert heat causes the air to blur and quiver, creating mirages that shimmer in the soaring temperatures, the ideal setting to explore in the time honoured manner of the Tuareg nomads. Taking to camels, we form our own caravan, to reach the dunes at Tidri (the camel ride may take place in the late afternoon on summer departures). The Arabian camel is ideally suited to these conditions and has long been highly prized by the nomadic peoples of the desert. Living for up to 40 years, they are not only valued for their endurance as beasts of burden, but also for their fur, skin and dung, all of which can be utilised for tents, leather and fuel for the fires. Stopping to enjoy the quiet desolation of the setting and to learn something of desert life, we reach our overnight camp to enjoy a late afternoon of bread making, before settling down under a desert sky for the evening. After a hearty Berber style meal we enjoy a night under the twinkling blanket of the African sky. Rather than sleeping in tents, you may choose simply to sleep out in the open, enjoying the rare majesty of the setting and watching out for shooting stars racing across the horizon. Please note a sleeping bag is required for this night, these can be hired locally at an extra cost of 160 Moroccan Dirham (approx £13) per person and need to be requested in advance of travel. Retracing our steps this morning we head north once more by camel for a couple of hours back to the road. We will make a stop at the settlement of Tamegroute to visit its famous 17th century zaouia, one of the most important in the Moroccan Sahara. This was once a centre of great learning and the base of the Naciri Brotherhood, who for centuries held sway over the tribes of the Draa Valley. The holy leaders of Tamegroute were traditionally (up until quite recent times) the arbitrators of desert disputes, settling differences amongst the residents of the surrounding kours and the traders that passed through these lands on the great camel caravans that journeyed through Zagora. We'll also pay a visit to the local potters' cooperative, before continuing back to Ouarzazate later this afternoon. Located in the main avenue of Ouarzazate and close to the main market, the hotel has a swimming pool and the rooms are air conditioned. A morning drive takes us northwest back to Marrakech, where we'll have the rest of the day to explore a city that has for centuries been a meeting place for the mountain Berbers and the desert peoples of the south. This afternoon there will be an opportunity to explore something of its rich heritage with a sightseeing tour of Morocco's fascinating Red City, a city that can boast a staggering array of spectacular architecture and wonderful facades. Like many North African cities, Marrakech is divided into two distinct parts, the Gueliz (the modern French-built city) and the Medina (the Old City), a place where trade and barter amongst the colourful souks still has at its ancient heart a glittering cacophony of noise and colour. Journeying into this vibrant city with a local guide affords a chance to discover some of its most enthralling sites. The city's beating heart is the spectacular Djemma-el-Fna, a site not to be missed and a scene straight out of the pages of the Arabian Nights. Here you will find the streets and alleys alive with storytellers and musicians, jugglers and acrobats, snake charmers and clowns. You can wander past vendors selling doughnuts and fried grasshoppers, meander through native markets where Muslim women, their hands and feet dyed with henna, call out to sell their wares, and enjoy the sounds and the smells of the exotic. After our tour you may like to take some time to enjoy more of the remarkable Medina, haggling for a bargain or two, or simply sit at one of the local cafés and watch the street tableaux unfold before you. Do remember that many of the mosques may be forbidden to non- Muslims and be careful of photographing women, as this may be unacceptable, it is always best to ask. The tour ends today in Marrakech after breakfast. Depending on the schedule of your flights, you may be able to spend some additional time wandering the souks before returning home. Note; on the summer departures, the tour leader may adjust the timing of when the activities take place based upon daily temperatures on the day. Morocco is a Muslim country and it is important to dress with respect for local customs. People may be offended by shorts or revealing dresses, which can attract unwelcome attention. We advise that in general both men and women should cover shoulders, upper arms and knees. Transparent, plunging necklines and tightfitting clothes should be avoided. Women and older girls should also cover their heads when entering a sanctuary, though in general, mosques are forbidden to non-Muslims. While cycling it is no problem for you to wear your regular cycling gear, tight fitting or not. Summer: Clothing should be lightweight. However, a warm jumper is also advisable, as the desert can sometimes get cold at nights, even in the summer. Winter: Warm days but much thicker clothing is essential for cold nights (between November and March). It is advisable to take warm clothing (eg. track suit or thermal underwear) to sleep in, as the quality of heating in Moroccan hotel rooms can be variable. A waterproof jacket, jumper trousers and fleece are recommended between December and March. It may also be worth bringing cycling gloves for the mountain bike ride. Lightweight walking bootshoes, plus sandals or trainers for relaxing. One piece of baggage (suitcases not suitable as luggage is stored on the roofracks of our 4WD vehicles and we are restricted on weight) and a daypack for the walks. A head torch, water bottle, sunhat and high factor sunscreen are all essential, whilst we recommend swimming costumes and towels. Sleeping mattress will be provided for the desert camp or you may prefer to bring your own thermarest. Please also bring a 3-4 season sleeping bag depending on season. Sleeping bags can be hired at an extra cost of 160 Moroccan Dirham (approx £13) per person, these must be requested in advance. You may like to bring your own helmet for cycling to ensure a good fit. These can then also be used for the mule and camel rides. The hotel in Marrakech is located in the new city centre with a 20 mn walk from the main Jamaa El Fna Square. The hotel has a swimming pool and a restaurant and the rooms are air conditioned. We then move into the mountains where we stay in a family owned gîte village house which has a number of rooms and shared facilities as well as a nice terrace for great views of the valley. We stay in a hotel in Ait Ben Haddou which is located opposite the famous Kasbah of Ait Ben Hadou. The swimming pool and the restaurant overlooks the Kasbah and the valley of Ounilla. The rooms are air conditioned. The hotel in Tamnougalt is located in the middle of the Draa valley with its green palm groves and easy access to the valley for nice walks in the fields. The hotel is designed in a Kasbah style and has a swimming pool with air conditioned rooms. After our camping experience in the desert, we stay in a hotel in Ouarzazate which is located in the main avenue of the town and close to the main market in the city centre. The hotel has a swimming pool and the rooms have air conditioning. 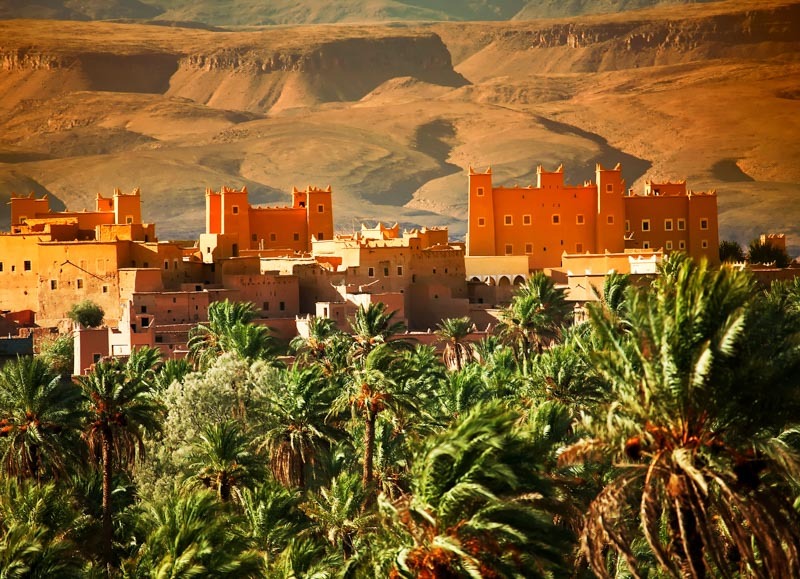 High peaks, vast deserts, captivating Marrakesh: Morocco is an easy going country to travel to with children of all ages and with a direct flying time between London and Marrakesh of just 3 hours 20 minutes, travel comes without the trials of a long haul flight. We’ve packed a great deal into eight days. Starting and ending in Marrakech there is plenty of time to explore the labyrinth of market stalls that has firmly put Marrakech on the map. Venturing out of the city we journey over high mountain peaks to the sand dunes of the Sahara where we get to ride a camel to our Bedouin desert camp. Other highlights include cycling in the fertile landscapes of the Draa Valley, visiting the film studios outside Ouarzazate and witnessing the beauty of Ait Ben Hadou with its historic Kasbahs blending into the landscape. Triple Rooms: This trip allows the option for a limited amount of triple rooms to be included within the booking on all nights except the Berber homestay on day 2 and desert camp on day 5. If you would like this option please ask our Sales team for further information. Average Age: As a guide we have identified the actual average age of the children who have travelled on this trip over the last 5 years, to help you decide whether it's the right one for your family. The average age on this trip is 14 years old; this trip is suitable for children of all ages. Be aware that it will be very hot over May half term and the summer holidays. This tour is designed for families who enjoy a range of activities from riding mules in the High Atlas mountains and camels in the desert to cycling to a film studio and walking amongst the mountains and visiting the Berber villages and their people. It's a journey as well as an active trip where the scenery changes daily and it gives you the chance to meet up with locals including a unique experience where camel handlers of the nomad tribes share a their lifestyle with the group. Also note, we have priced this trip on a direct flight with BA arriving in the afternoon. There are alternative options including with Air Maroc which flies via Casablanca and arrives late at night.